I'm 60. That means I'm only 30 years off 90. If I'm somehow able to live another 30 years, and I come from a family where barely anyone does, I will be 90. That sounds ancient, but the last 30 years went by pretty fast, so all I have to do is trip over that family birthdays again! 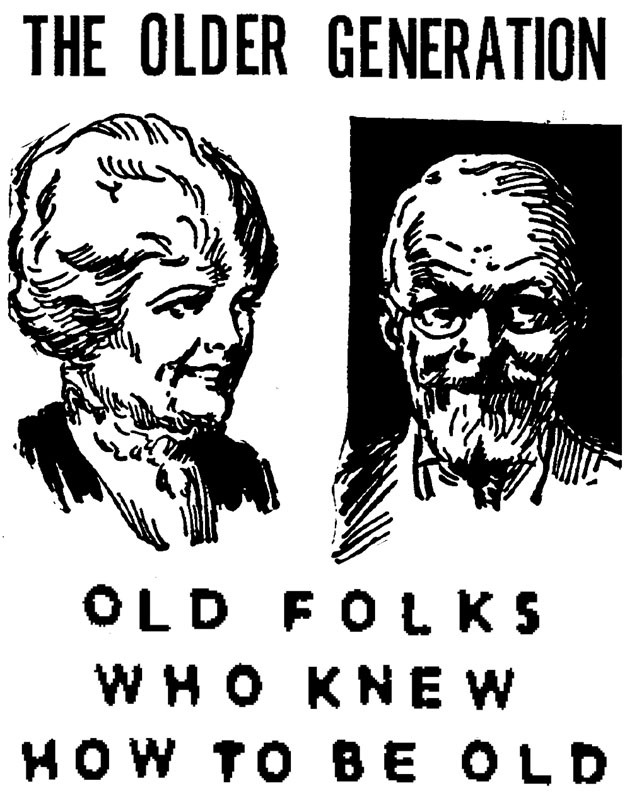 When I think of old people, one little truth keeps creeping in. Old people are changing all the time. They're not consistently the same. The average person at Woodstock was older than me. So they're creeping up there now. But the average person as old as them at the time of Woodstock was a completely different person. Different background pretty much completely. They were practically people of my grandparents' generation. Let's see, at the time of Woodstock, 1969, my Grandma was only 65, almost 66. That sounds youngish, even though she was from a generation of people, at least from my kid perspective, who were definitely old when they were 65. Grandpa was six years older, so he was already over 70. He seemed ancient. Neither of them made it to 90, by the way. I remember them laughing, of course. But they didn't have that kind of constant sense of humor people have now. Which is actually annoying, because we've seen too many crappy sitcoms, I'm convinced that's what it is. (You ever notice people on sitcoms are constantly cracking jokes, but the other characters aren't laughing?) But it does tend to give people a more youthful attitude. My grandparents weren't humorless, as I said, but they had a serious quality that I don't see much of today. It made them seem older. I've been watching the old episodes of the Lawrence Welk show on PBS, whenever I think of it. I might watch one, then forget it for three weeks, then I watch another. These are generally from 1964-1970, I'm estimating. I love watching them, even though I wasn't a fan of the show at all when it was first on. But now, the very square quality of it gives me a constant sense of the way old folks were then. About the best part of it, what I really like, is when they show the old folks in the audience, with some of them dancing. I always have to think, now they're a'moldering in their graves, for the most part, but there they were at the time, exactly the generation I'm talking about. There aren't too many film sources for the average everyday person of that time, at least that I know of. But Lawrence Welk had them! You can see them laughing in happiness at the music, the dancing, and being together with others. And for the most part, it looks exactly like the very conventional (and only occasional) humor I saw in old people at the time. The show's a time capsule. Old folks of that generation went through a lot. Such as the Great Depression, so bad we capitalize it. And of course there were those minor skirmishes, World Wars I and II, so bad we Roman numeral them. I don't agree with the common labeling, thanks to Tom Brokaw, that these folks were in any sense "The Greatest Generation." I think they just made it through their times like anyone would, given the circumstances. You deal with what you get. But it really might have given them that serious outlook, the more business-like approach to life they had. OK, I didn't mean to get sociological on you. But how else can you mess around with a subject like this? Nursing homes are full of folks over 90, and I suppose I could go over and visit a few of them. Anyone's allowed, I guess, although it's better if you have some legitimate reason for dropping in, other than the fact that you write a blog and are interested in 90-year-olds. They might frown on that! Who knows? But if there's people from your church there, you could drop in legitimately. Then get to know some of the others. But, like I said, 90's different all the time. The 90-year-old in the nursing home today is quite a bit different from what my grandparents would've been. If you're 90, you were only in your mid-40s at the time of Woodstock. So very young. But they're still plenty old in certain ways, having accrued the things of age since then, no doubt ... they need to be met and known!